What is an Impairment Rating and How is It Calculated? ?I don’t like the workers’ compensation doctor or other medical provider. Can I choose a different one? ?Can an employee injured at a company event in Des Moines still file for workers’ comp? ?What are the most common hazards in the workplace cited by OSHA? In terms of the workers' compensation process, an impairment is classified as an inability of the patient to (1) use his or her bones, muscles, joints, limbs, ligaments and tendons as well as he or she did prior to the injury or (2) control his or her spinal cord, brain and peripheral nerves as well as he or she did prior to the injury. The doctor will assess the patient through various medical tests and procedures to determine the level of ability lost. If the patient shows any loss of function, the doctor will assign an impairment rating. The rating is determined by the American Medical Association Guides to the Evaluation of Permanent Impairment. The doctor also may use his or her own judgment to determine what is normal based on the patient’s medical condition before the injury. If the impairment is within a certain range, the doctor will take into account activities of daily living (ADL). These activities include personal hygiene, communication, physical activity, sexual activity, sensory function, travel and sleep. The doctor will determine how the impairment will limit your job functions. For example, an impairment rating of 30% might be a big deal if your job is physically demanding, like carpentry. However, if your job is primarily sedentary in nature, the impairment won’t affect your job duties to a high degree. Your doctor will record a medical history and perform a physical evaluation. He or she will also check your vital signs and inquire about any problems you have with ADL. Your doctor will ask about any medications you are taking and refer you to a specialist if you have any chronic injuries. If you have more questions about workers' compensation in Iowa or impairment ratings, you may consult the frequently asked questions section of this website or contact one of the attorneys at Walker, Billingsley & Bair law firm who specialize in personal injury law. Call 641-792-3595 or contact us online to schedule a free consulation. 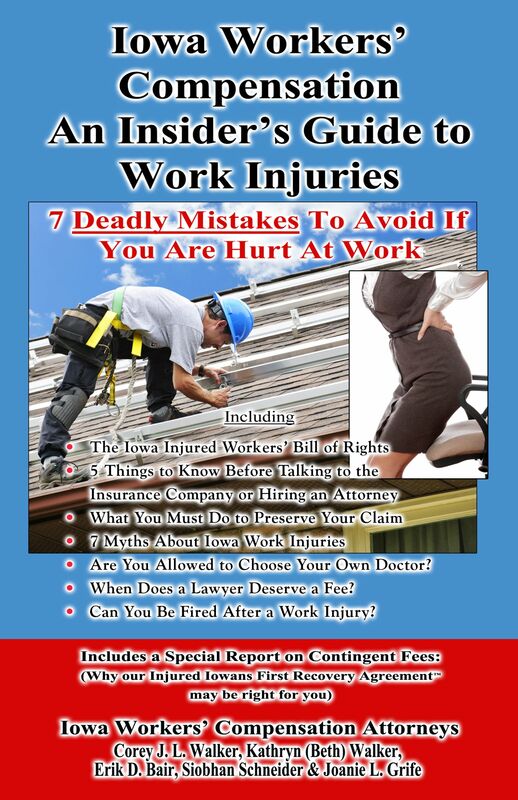 To learn more about Iowa work injuries including the "7 Mistakes To Avoid If You Are Hurt At Work" order your copy of our FREE Book entitled "Iowa Workers' Compensation- An Insider's Guide to Work Injuries". Why offer a Free Book? Since 1997, as a workers' compensation attorney I have represented hundreds of Iowans hurt at work from Des Moines, Newton, Pella, Grinnell, Iowa City, Cedar Rapids, Knoxville, Oskaloosa, Ottumwa and from throughout the state of Iowa. I have seen too many clients make mistakes before they had the "right" information resulting in them losing thousands of dollars. Finally, you can learn about work injuries in the comfort of your own home with no risk or obligation. However, quantities are limited so to learn how to avoid costly mistakes and your rights click on the work injury book image on this webpage, go to http://www.IowaWorkInjury.com or Call Now (800)-707-2552, ext. 811 (24 Hour Recorded Message).